The GX2, a lighter feeling rod but with the same toughness of the original blank. These spinning rods are virtually unbreakable and with the new addition of "Ugly Tech Construction", "Ugly Tuff Guides" and "Ugly Stik Clear Tip" technology, theres not a chance of any fish getting the better of you! With varying lengths and actions, theres an Ugly here for everyone! 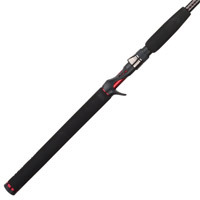  Graphite and fibreglass construction create a strong, yet sensitive rod with better balance.  Newly designed guides provide maximum durability.